﻿ Job 1:21 He said, "Naked I came from my mother's womb, And naked I shall return there The LORD gave and the LORD has taken away. Blessed be the name of the LORD." saying: Naked I came from my mother's womb, and naked I will leave this life. The Lord gives, and the Lord takes away. Praise the name of the Lord. and exclaimed: "I left my mother's womb naked, and I will return to God naked. The LORD has given, and the LORD has taken. May the name of the LORD be blessed." And he said, Naked I came out of my mother's womb, and naked I shall return there. LORD gave, and LORD has taken away, blessed be the name of LORD. and he said, Naked came I out of my mother's womb, and naked shall I return thither: Jehovah gave, and Jehovah hath taken away; blessed be the name of Jehovah. And said, Naked (without possessions) came I [into this world] from my mother's womb, and naked (without possessions) shall I depart. The Lord gave and the Lord has taken away; blessed (praised and magnified in worship) be the name of the Lord! With nothing I came out of my mother's body, and with nothing I will go back there; the Lord gave and the Lord has taken away; let the Lord's name be praised. and said, Naked came I out of my mother's womb, and naked shall I return there. The LORD gave, and the LORD has taken away; blessed be the name of the LORD. And he will say, Naked I came forth from my mother's womb, and naked shall I turn back there: Jehovah gave, and Jehovah took; the name of Jehovah shall be blessed. And said, Naked came I out of my mother's womb, and naked shall I return there: the LORD gave, and the LORD has taken away; blessed be the name of the LORD. Then he said, "Naked I came out from my mother's womb, and naked I will return there. Yahweh gives, and Yahweh takes. Let Yahweh's name be blessed." And he said, I came naked out of my mother's womb, and naked shall I return there. Jehovah gave, and Jehovah has taken away. Blessed be the name of Jehovah. and said, "Naked came I out of my mother's womb, and naked shall I turn thither again. The LORD gave, and the LORD hath taken away; now blessed be the name of the LORD." He said, "Naked I came from my mother's womb, and naked I will return there. The Lord gives, and the Lord takes away. May the name of the Lord be blessed!" He said, "Naked I came out of my mother's womb, and naked shall I return there. The LORD gave, and the LORD has taken away. 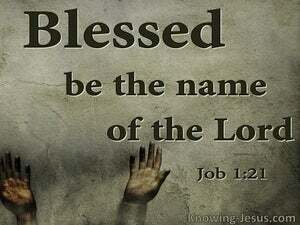 Blessed be the name of the LORD." and said - Naked came I forth from the womb of my mother, and naked must I return thither, Yahweh, gave, and, Yahweh, hath taken away, - The name of Yahweh be blessed! And said, Naked came I from my mother's womb, and naked shall I return thither: The LORD gave, and the LORD hath taken away; blessed be the name of the LORD. 20 Then Job arose and tore his robe and shaved his head, and he fell to the ground and worshiped. 21 He said, "Naked I came from my mother's womb, And naked I shall return there The LORD gave and the LORD has taken away. Blessed be the name of the LORD." 22 Through all this Job did not sin nor did he blame God. As he had come naked from his mother's womb, so will he return as he came He will take nothing from the fruit of his labor that he can carry in his hand. For when he dies he will carry nothing away; His glory will not descend after him. "Now do not be grieved or angry with yourselves, because you sold me here, for God sent me before you to preserve life. "The LORD makes poor and rich; He brings low, He also exalts. "Perhaps the LORD will look on my affliction and return good to me instead of his cursing this day." So the king did not listen to the people; for it was a turn of events from the LORD, that He might establish His word, which the LORD spoke through Ahijah the Shilonite to Jeroboam the son of Nebat. Then Hezekiah said to Isaiah, "The word of the LORD which you have spoken is good." For he thought, "Is it not so, if there will be peace and truth in my days?" "But put forth Your hand now and touch all that he has; he will surely curse You to Your face." But You have cast off and rejected, You have been full of wrath against Your anointed. Therefore glorify the LORD in the east, The name of the LORD, the God of Israel, In the coastlands of the sea. Is it not from the mouth of the Most High That both good and ill go forth?